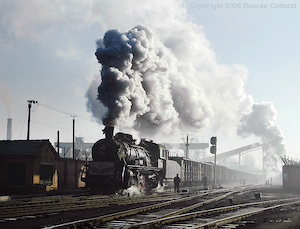 SY 0791 is seen getting underway from Yijing with a long loaded coal train bound for the CNR interchange at Heitoushan on the bright but misty morning of 2nd March 2005. 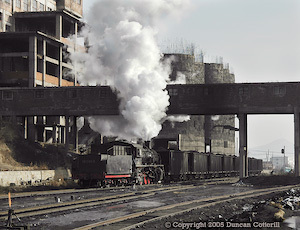 SY 0863 enters the Beichang washery complex with a train of coal hoppers from one of the mines east of Dongchang on the afternoon of 5 March 2005. In the background, half finished silos and other colliery buildings tower over the train like a 20th century version of Conway Castle. Dongchang is the hub of the Chengzihe system as well as being the site of a working mine. We found SY 0237 shunting empties there at sunrise on the morning of 6 March 2005. SY 0804 is seen in the foreground awaiting its next job in the company of SY 1340 and SY 1369 on the morning of 5 March 2005. Several km east of Hengshan, SY 0341 crosses open countryside with a short train of empties for Zhangxin colliery on the morning of 6 March 2005. SY 1118 is seen here crossing a small river on its way back to Lishu Xinfeng yard with loads from Qikeng colliery while, in the background, SY 1118 stops to pump up its brakes on the descent from Qikeng with the same train a few minutes earlier. Yes, this is a composite photo made from two pictures of the same train, taken from the same spot a few minutes apart and illustrates the switchback nature of the line. Coal traffic was sparse during our visit to Dayan on 8 March 2005. The only significant working was this long loaded coal train seen waiting to depart from Erjing yard to Jipei with SY 1307 at its head and SY 1741 bringing up the rear. On the morning of 9 March 2005, SY 0471 was in the process of unloading its train while SY 1286 waited to return to the coalface to pick up its next load. Lots of engines, working hard in remarkable surroundings. 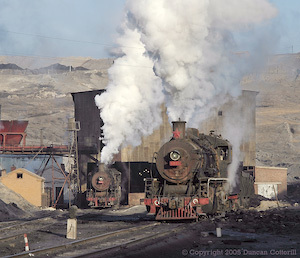 Zhalainuoer certainly isn't the most beautiful place to see steam at work but it must be the most spectacular. 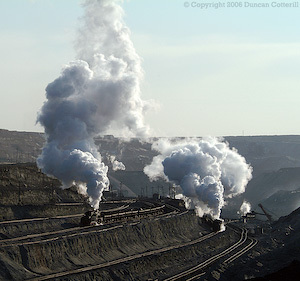 Two loaded spoil trains start their long journeys to the spoil tips on 09 March 2005. At the bottom of the pit, coal is dug straight out of the ground by huge mechanical shovels and loaded into tipper wagons for transport to the unloading shed. SY 1663, another decorated engine, waited patiently while its train was loaded on 11 March 2005. This shot taken on 11 March 2005 shows a coal train loading at the bottom of the picture. To the right of the shovel, a train of empties heads for one of the other loading points. On the higher level a loaded coal train is entering the reversing station while an empty spoil train (left) and a loaded spoil train (right) wait to make their next moves. 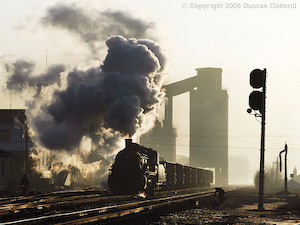 This report covers a short trip to several steam worked industrial railways in the North East of China during early March 2005. Peter Breeze and Richard Lewis joined me for the trip. Arrangements within China were made by Sun Xiaolan of CLSLPA and we were accompanied throughout by Deng Feng of the same organisation. Winter in the North East can be unbearably cold but spring tends to be warm and wet. For a brief period in between it's not too cold but still bright and sunny. Fortunately, our trip coincided with this transition and we enjoyed virtually unbroken sunshine for the duration. The reports of previous visitors were a great help in locating the steam action and finding worthwhile photo positions. In particular, the reports and maps produced by Florian Menius and Bernd Seiler proved invaluable and should be required reading for anyone contemplating a visit. Thanks for your efforts. Rather than cover the same old ground again in this report, I'll try to restrict myself to those aspects previously unreported or where we found things had changed. A short visit to the Beijing Railway Museum revealed no changes since September 2004. We travelled on train 2537, the 14:10 Beijing - Tonghua, all the way to Meihekou. In spite of its relatively high number, this was a very clean, comfortable, modern train with immaculately turned out staff. The route from Beijing was via the "new" main line to Langwopu, east of Fengrun then via Maliu, joining the "old" main line at Luanxian, east of Tangshan, and following it to Qinhuangdao. From Shanhaiguan we took the high speed line via Jinzhou Nan to Shenyang. Power was provided by an SS9G to Shenyang then an unidentified diesel to Meihekou. At Beijing, all the passenger trains noted were hauled by either DF11s or DF4Ds. All the DF11s seen had Beijing shedcodes but the DF4Ds identified were allocated to Fengtai (DF4D 0356) and Beijing Xi (DF4D 0024). No NY7s were seen but at least two pairs of single ended BJs (2000 series) were on Beijing depot along with many DF11s, DF11Gs and SS9s. At least one of the DF11G pairs seen had Beijing shedcodes. East of Beijing on the "new" main line, most freight was in the hands of Tangshan allocated SS1s. A large depot with a number of SS1s was noted on the south side of the line, just east of Fengrun station, which is presumably where they are based. A DF7 and a DF4B with Tangshan shedcodes were also seen at Fengrun. Shortly afterwards DF4 0225 was noted on a ballast train. Most of the passenger locos were unidentified as they passed too quickly to register in my jetlagged brain but a number were definitely diesel hauled, one with a pair of DF11Zs. Although the "old" main line is electrified east of Luanxian, all the freight seen was diesel hauled, mainly by Tangshan based DF8B, although a few DF4s were also seen including DF4 1033, with a Chengde shedcode, on a long train of welded rail. A number of coal trains were seen in the Qinhuangdao area with double pairs of SS4Gs, i.e. 4 locos. 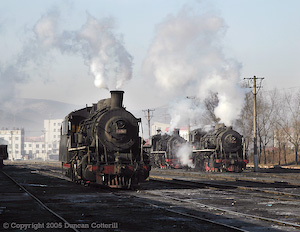 These are thought to run via the dedicated coal line from Datong. At Shanhaiguan an SS9G with a Shenyang shedcode was noted. The DFH1 which has been dumped at Shanhaiguan for years was not seen this time. Hopefully it's been preserved and not scrapped. East of Shanhaiguan on the new high speed line there was little to see in the dark. Over the next couple of days we saw several freights on the line south of Meihekou, all DF4C hauled. On the face of it, this system is nothing special. It's virtually devoid of scenery, has no steep gradients, unusual engines or features of particular interest, yet it's a delight to photograph. Our two days here were most enjoyable. The main news is that the diesel remains out of use and all trains seen were SY worked. Information from Derek Phillips indicated that the maintenance costs of the diesel had proved to be excessive. Four locos were required to work the service but we saw five in use as SY 0791 and SY 1217 swapped over during our visit. SY 1564 was the regular passenger loco. All locos face south-west, i.e. chimney first towards Sanjing, and are in good external condition. Dumped SY 1445 is complete and appears to be in reasonably good condition. Mines 2, 3, 4 and 5 are active and rail connected. Coal lorries were seen coming from the direction of mine 6 but the rail connection from Erjing remained out of use. Mine 5 is served by a branch that leaves the main line between Erjing and Sanjing at a station called, unsurprisingly, Wujing. Yijing is the hub of the system and location of the loco depot and other facilities but no coal was actually seen being loaded there so Mine 1 may be closed now. No activity was seen on the narrow gauge electric line that crosses Yijing yard on a bridge either. The narrow gauge systems at mines 2 and 3 were still in use. I've redrawn Florian's map with the correct NE - SW orientation and some extra detail based on what we found. Click on the map to see a full size version. There’s also a high definition version in the maps section. The bulk of the coal output appears to come from mines 3 and/or 5 and several long trains of loads from these mines were seen during our visit. Even so, coal traffic to CNR at Heishantou was infrequent, probably only two trains per 12-hour shift. There was a regular train between 08:00 and 09:00 then nothing until late afternoon. 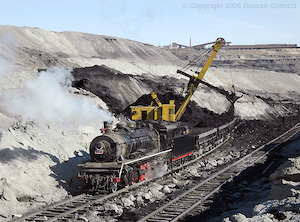 In addition to the coal trains, trains of spoil ran from mine 4 to a dump at mine 2. One of these spoil trains appeared to regularly follow the 14:15 passenger from Sijing. Out of use: SY 1445, DFH5 4010. From Meihekou we travelled to Siping by road then overnight train to Mudanjiang and onward by road to Jixi. The first stage to Siping took around three hours but would have been quicker if it hadn't been snowing for much of the journey. From Meihekou to a point beyond Liaoyuan, the road was a new dual carriageway with moderate traffic and progress was rapid. Beyond Liaoyuan, the new road was still under construction and travel over the old potholed road was slow. A few DF4C hauled freights were seen on the parallel railway. A number of SS4G hauled freights were seen at Siping while we waited for our train, 2017, the 19:00 Shenyang - Mudanjiang, which was hauled by SS9 0043 (Shenyang) as far as Harbin. From Harbin to Mudanjiang we had an unidentified DF4D 3xxx on the front. Freight traffic seen at the east end of the Mudanjiang line was hauled by a mixture of DF8s, often in pairs, and DF8+DF4B combinations. At Mudanjiang, N69 was seen waiting to depart for Qitaihe behind a DF8. Nothing of railway interest was seen on the road journey to Jixi. The new dual carriageway road heads north to a point east of Linkou before heading north-east to Didao. However, it takes a route over the hills and, except for a very short stretch near Mashan, is distant from the railway. Jixi is one of China's major coal mining centres with an annual output in the region of 30 million tons. The city of Jixi and the surrounding area are dotted with numerous mines of various ages and sizes. Some mines are adjacent to CNR lines and are served directly. Many others are served by a number of steam worked industrial railways operated by the local mining administration. Click on the map to see a full size version. This compact system north west of Jixi is more complex than we'd appreciated from the published information and maps. The western line from the washery at Didao Hebei to Lijing splits soon after leaving Hebei. The lower branch parallels the Mashan road to the coal silos at Lijing. The upper branch climbs steeply up the hillside overlooking Lijing to end at a loading point further up the valley. A pair of reverses from the upper branch lead to a tip even higher above Lijing. Click on the map to see a full size version. Photographically, we found this system difficult. All locos face north at the washery so shots with this impressive structure in the background are inevitably of tender first locos. Propelling moves are also common, so even if you find a spot where the loco faces the right way, you won't necessarily find it at the front of the train. Some of the tipper wagons even have a cab at the end to shelter the guard while propelling. We had more success on this excellent system. The areas around Chengzihe Beichang washery and Dongchang mine were particularly busy and, although the locos faced either way at random and propelling moves were common, we never had to wait too long for the required consist to appear. The line crosses a long concrete river bridge west of Chengzihe Nanchang but the view is marred by lampposts on the railway bridge and the proximity of a second, earlier, bridge, now used as a footpath. Between the bridge and the junction with CNR at Jixi Xi, a branch leaves the line to serve a large modern mine, not shown on the published maps. This line is worked by Chengzihe SYs. The expected procession of locos from Xinhengshan to Dahengshan at the 08:00 shift changeover failed to materialise. Instead, locos travelled to Dahengshan individually, if required. The majority seemed to remain at Xinhengshan and go back to work without visiting Dahengshan at all. We didn't see the expected double headed and banked trains from Xinhengshan to Zhongxin either. This was a stroke of luck as we got four single headed trains up the bank, one after the other, between 09:00 and 11:30. This is maximum thrash territory with the SYs worked flat out from the end of the yard at Hengshan in a desperate attempt to make the top of the bank without stalling. One of the trains we saw wasn't going well enough at the bottom of the hill and slowed to less than walking pace before it got halfway up the hill. It got to the top eventually but only after a lot of slipping and hand sanding. In contrast to the urban surroundings close to Hengshan, the eastern end of the Zhangxin line is quite rural, passing through pleasant open countryside east of Erdaohezi. The locos seen here and at Chengzihe and Didao were relatively scruffy. This little visited system is centred on Xinfeng yard in the town of Lishu, 24 km southwest of Hengshan. A direct road of reasonable quality leads directly from Hengshan to Lishu and parallels the north-eastern branch of the system for the last few km into Lishu. Click on the map to see a full size version. From Xinfeng, branches serve mines in the hills to the north-east and south-east. A third line connects Xinfeng to Lishuzhen, the CNR interchange a few km to the south-west. The south-eastern branch to Liukeng, Bakeng and Sankeng appeared to be open but there was evidence that no trains had run for a few days. We didn't explore it any further. The north-eastern branch was in use and saw at least two movements during the three hours we were there. The line to Qikeng (7th Mine) is definitely in use but it's not clear if the whole line to Wangliang is still open. This system is worthy of further exploration as it runs through a very pleasant rural area with good scenery and some steep gradients. Traffic does not appear to be heavy. Only two locos are based at Lishu and were both in use during our visit, one tripping to and from Qikeng while the other shunted and tripped to the CNR interchange at Lishuzhen. Both locos were in good external condition. Florian reported seeing SY 0408 at a mine a few km south of Jixi in March 2000. We saw no sign of steam on any of our four trips past the site. CNR traffic to and from Hengshan was worked by DF4Bs with pairs on loaded coal trains. The Hengshan pilot was DF5 2056 in a snazzy blue and white livery. We travelled from Jixi to Mudanjiang by road then took train N4 at 14:00 to Harbin. Instead of the expected diesel unit, the train was formed of DF4D 3031 (Sankeshu) and 6 lightweight coaches numbered 2 to 7. We had reserved seats in coach 1, which caused a moment of panic before we were directed to vacant seats in coach 2. 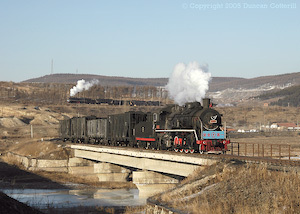 The biggest surprise of the whole journey came before we left Mudanjiang when a pair of DF8Bs were seen heading south through the station on a freight. I can't recall seeing any reports of DF8B north of Shenyang before. DF4 7111 and DF4 2200 were seen on northbound and southbound passengers, respectively, at Mudanjiang. On the journey to Harbin all passengers seen were DF4B or DF4D hauled. Freights were worked by DF8s and DF4Bs, often in pairs, sometimes mixed. No steam was seen en route. From Harbin, we continued west on train N91 at 20:12 from Harbin to Dayan. Freights around Dayan and westward to Manzhouli were all DF4B hauled, usually in pairs but some singles and one triple were also seen. Passengers were hauled by DF4Ds or 2xxx series DF4Bs. We spent a bitterly cold morning on this system, waiting in vain for an uphill train on the bank east of Erjing. 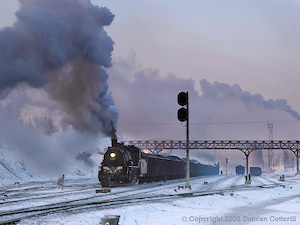 After getting the uphill passenger and a long downhill coal train just before sunrise, we stood around for over 6 hours in temperatures as low as -28ºC while light engines travelled up and down the bank at regular intervals. The only trains we saw were the downhill passenger and trip workings of 4 wagons to and from the power station. In common with previous visitors, we found all the locos facing east, i.e. chimney first downhill. The locos were nicely turned out but the lack of trains was frustrating. It isn't known whether our experience was typical or possibly just bad luck. Thoroughly underwhelmed, we left for Manzhouli by road at lunchtime. The journey was a slow one. From Dayan to Hailaer took no less than 2 hours on an appallingly rough road that often disappeared under the construction work for an unfinished new dual carriageway. At times we left the road altogether and set off across the fields to try and find a better route. When the new road eventually opens, progress should be much faster. From Hailaer to Manzhouli, the road was better but potholes and rough patches were still relatively common. The route was far to the north of the railway through some of the most remote, barren, unpopulated areas in the country and reminiscent of parts of eastern Turkey. The last section from Zhalainuer was along a brand new dual carriageway. Hailaer to Manzhouli took another 3 hours. Manzhouli is a strange place. It's a clean, modern, bustling city in the middle of nowhere and seems to exist solely to sell consumer goods to Russians, who cross the border in droves to buy stuff they can't get in their own country. 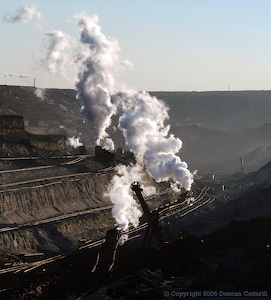 The large opencast coal mine at Jalainur (or Zhalainuer) is around half an hour's drive from Manzhouli. In spite of reading all the relevant reports, nothing really prepared me for this place. The scale of the mine and the intensity of the railway operation have to be seen to be believed. There's rarely a moment when a steam loco can't be seen moving somewhere and a little patience will reward you with shots of two, three or four trains moving simultaneously. It's often difficult to know where to point the camera, there's so much going on. The operation was broadly as Florian Menius described it but we didn't find locos consistently allocated to duties the way Florian suggested. A loco that was seen on coal duties one day could appear on spoil trains or construction trains the next day. The only consistent split was between deep mine system locos and opencast system locos. However, the washery pilots appeared to be opencast system locos, not deep mine engines as expected. We couldn't find a shed as such but loco servicing points, with coal, water and sand, exist at the coal unloader inside the opencast pit and at Nanzhan, near the southern spoil tips. There is also a store of 20 locos at Dongzhan, including some in ex works condition and others that look virtually dumped. When Richard was here in March 2004 there were 28 locos in store. Of these, 13 are still in store, 11 are now back in traffic and 4 have disappeared, although 3 of these have been reported in traffic during the past 6 months. The condition of the working locos varied considerably. Some were quite clean and shiny while others looked scruffy. SY 1600, 1663 and 3005 all had brass boiler bands and cabside decorations. Dongzhan Store: SY 0613, 0614, 0957*, 0958, 0959*, 1192, 1256, 1284, 1401, 1450, 1496*, 1587, 1601, 1617, 1619, 1654*, 1664, 1678*, 1689, 1690. Very little time was spent on this relatively unphotogenic system. A persistent north westerly wind would have made photography difficult anyway. We did find that all the locos gathered at Daqiao around 07:30 for servicing and a shift change. 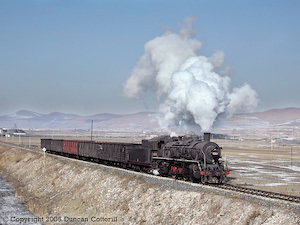 All locos are scruffy and face west at Daqiao. None of the locals seemed to know why the station is called Daqiao but confirmed that there was no big bridge in the vicinity. The deep mine passenger arrived at Daqiao from Lingquan at 07:17 and should have left again at 08:20 but finally departed about 20 minutes later. As noted above, the washery shunts are performed by opencast mine locos, which face the opposite way to the deep mine engines. Three locos were dumped within a walled compound at Daqiao, one of these couldn't be identified but although it looked like an SY, it had a non standard tender of the type usually coupled to earlier locos such as JFs or JF6s. Daqiao Dump: SY 1234, 1448 + 1 other. We travelled to Hailaer by road then flew to Beijing with Hainan Airlines on flight HU 7102. Take off was preceded by an announcement in Chinese and English that passengers should check that they were on the right flight. This was somewhat superfluous as ours was the only plane that day! Although the on board service was reasonable, the pilot's abilities were less than satisfactory. The landing at Beijing could be described as amateurish at best. En route, we flew over Chengde. No steam was seen outside the steelworks complex but several plumes of steam there could have been from locomotives. We had been told that the whole Dahuichang operation had closed due to concerns over dust pollution. As the weather was so clear, we decided to check for ourselves and found the system operating normally. It seems that a longer Spring Festival break was misinterpreted as closure. As usual two C2s spent the afternoon shuttling back and forth on the double track main line. After a disappointing visit to central China in late December and early January, this trip restored my faith in industrial railways. In contrast to the rather soulless, partially dieselised operations further south, we found railways with bags of character, 100% steam operation and plenty of excellent photographic possibilities. In total, we saw 55 different SYs in use and, for the first time in over 30 trips to China, no working QJs or JSs. On the positive side, there were no signs of imminent dieselisation anywhere. The only diesel on any of the lines we visited was safely locked inside the shed where it belongs. Meihekou is a splendid little system with nicely turned out locos and pleasant, uncluttered locations around the mines and stations. It was a great relief to find the diesel in store and all work being handled by the SYs. How long this situation will continue is unknown, but while it does, this line is well worth a visit. Although the nearby Tiefa system may be busier, it's nothing like as photogenic. There's a lot going on around Jixi with at least 5 individual railways serving a score of coal mines and washeries. The central area of the Chengzihe system was the most rewarding with plenty of traffic and the washery at Beichang and loader at Dongchang provided dramatic industrial backdrops. The Hengshan system offered maximum thrash on the steep banks and Lishu was surrounded by some fine scenery. In terms of the number of locos in use, Jixi is comparable with Pingdingshan but photographically it's far superior. Given a choice between the two, I'd go for Jixi every time. The line at Dayan has some photographic potential but the use of tender first locos on uphill trains is disappointing. That's if you're lucky enough to find an uphill train. It's not worth visiting in its own right but if you're on the way to Jalainur, stopping off for half a day would be justified. The opencast mine at Jalainur was utterly spectacular. I'd seen pictures before and read the reports of previous visitors but none came close to conveying just how good it really was. It's not easy to describe in words but imagine the track at Clapham Junction laid out vertically along the wall of a canyon and the whole service worked by steam. Of all the industrial sites I've visited in China over 20 years, this has to be the most rewarding photographically. Without exception, we got a friendly reception from the local people wherever we went. Even the management at Didao, previously reported as anti-gricer, didn't object to our presence and we managed to avoid the gripper at Dahuichang. I've always preferred photographing my steam in attractive countryside, whether it's the desert west of Zhongwei, the wooded hills around Nancha, the mountains of Dabaliang or the forests east of Huanan. It takes more than just a train to make a really satisfying photograph, the surroundings are at least as important in creating the final picture. Industrial locations can be interesting but they are frequently devoid of scenery, plagued with poles and wires and fairly unattractive. Meihekou, Jixi and Jalainur all had one thing in common, relatively uncluttered, industrial settings that produced rewarding photos. You can't ask for much more than that.